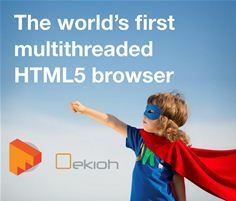 Cambridge, UK, 1st May 2018, Ekioh today unveiled Flow, a multithreaded HTML browser specifically designed for multi-core processors that delivers a vastly improved user experience. Flow’s layout and animation performance is more than double the speed of other browsers on multi-core silicon. This makes it perfect for powering the user interface (UI) on resource-constrained embedded consumer electronics, automotive and industrial systems. As processing power increases and graphical performance improves, so do consumer expectations of fast, high quality applications. Historically, browsers have automatically benefitted from rises in processing power, but this is no longer the case. When using multi-core silicon, applications can only benefit from headline performance improvements if all the cores and the GPU can be fully utilised. When traditional browser technology is used, product manufacturers miss out on the full benefits of multi-core. Flow is able to harness the combined computing power of multi-core processors to deliver layout performance that scales with the number of available cores giving a more responsive, smoother and faster UI experience. This is achieved by using a fine grained multithreaded architecture that aligns with the evolution path of multi-core silicon. Flow also takes a different approach to rendering, by making full use of the GPU. Rather than painting on the CPU, Flow handles all rasterisation on the GPU which is significantly faster and has the additional benefit of freeing up the CPU. Together, with multithreaded layout, these developments provide dramatically improved HTML performance without the need for content re-authoring. Flow joins Ekioh’s existing portfolio of WebKit and SVG browser technologies for the embedded marketplace which have already been deployed in tens of millions of products worldwide. Ekioh has been providing embedded browser solutions for over 10 years. The company’s products include the Ekioh UI Engine which delivers fast, responsive user interfaces based upon the SVG standard; the Ekioh TV Browser which supports the latest HTML5 features in a highly compact footprint; the Ekioh Twin Engine Browser which fuses UI performance and HTML features to create the ideal balance for Hybrid TV/OTT deployments, and Flow, a superfast HTML browser specifically designed for multi-core processors. Ekioh has been recognised with Queen’s Awards for Enterprise in both Innovation and International Trade categories. The company’s partners include Altech Multimedia, Arris, Broadcom, Beenius, Ericsson, Exterity, HiSilicon, Nagra, Sagem, Vestel, Zebra Technologies and ZTE.